Put the potatoes in a pot of water and bring to a boil. Cook until the potatoes are soft. Drain the potatoes and mash with the butter and milk until smooth and creamy. Add more milk if necessary, and add salt and pepper to taste. I use my hand held electric beaters for this. Cover and set aside. Brown the ground beef and 2 tablespoons of the rosemary in a skillet, taking care to break up the meat into a fine crumble as it cooks. Remove to a plate. Add the onions to the pan and cook over medium heat until starting to brown. Add a touch of olive oil if the pan is too dry. Remove the onions to the plate with the meat. Add 2 Tbsp butter to the pan and let it melt. Stir in the flour and stir for a couple of minutes until it turns a nice brown. Scrape up all the bits from the bottom of the skillet as you stir. Add the beef stock to the pan, whisking briskly to combine everything, and cook until it thickens. Add the beef and onions back into the pan, draining off any excess fat before you add it, and taste to adjust your seasoning. Meanwhile dust off the mushrooms and remove the stems. Carefully scrape out the gills with a spoon so that you have a nice space to put the meat. If the mushrooms are very large, put them on a dry baking tray and cook in the oven for about 10 minutes. Then fill each mushroom with the meat mixture. 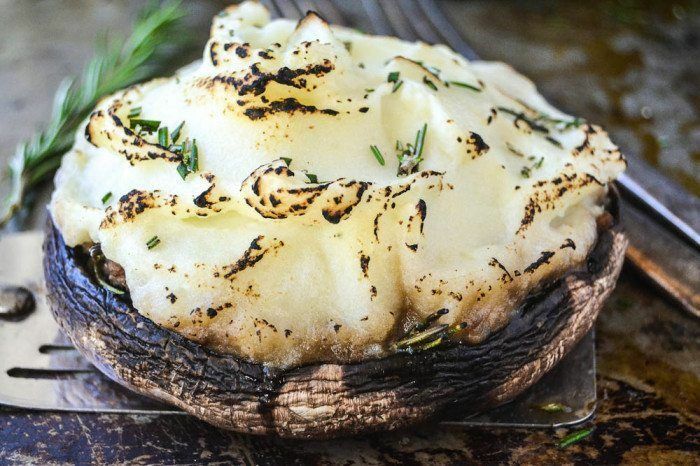 Top each mushroom with a generous amount of mashed potato and bake for about 15 - 20 minutes until everything is hot and bubbly. Serve immediately with a generous sprinkling of fresh rosemary and a side of boiled peas!